We may be biased but we think our location on this part of the island is really special. We are almost an hour’s drive from the ferry terminal at Craignure, and 50 minutes from the colourful capital Tobermory. 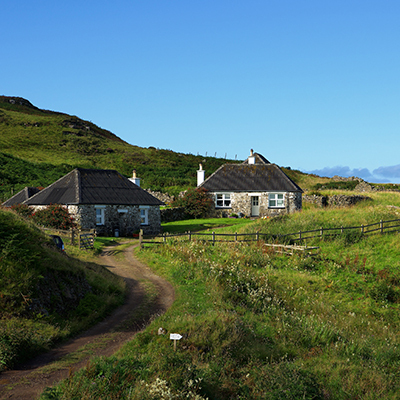 As you will read in the individual descriptions of the cottages the 4 Treshnish Cottages are half a mile from the main road. The additional mile from there down the unmetalled farm track to the 4 Haunn Cottages can seem a long, long way. For some it is not far enough – for others it is a mile too far. It depends how remote you like to be. 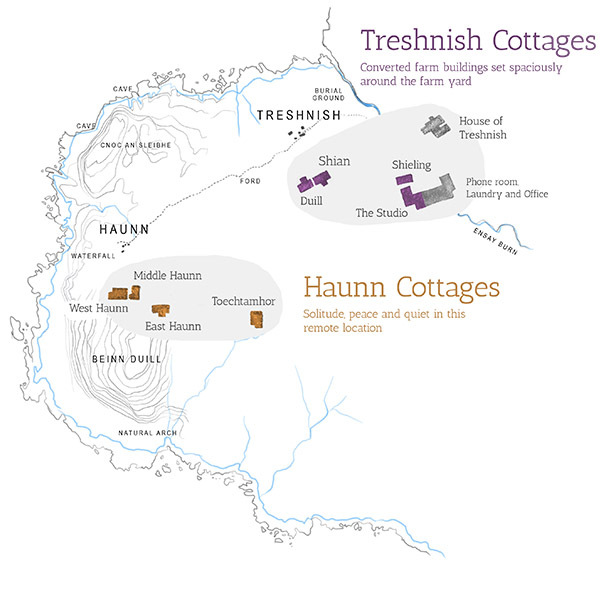 Some of our guests try the Treshnish cottages on their first visit, and then migrate to Haunn for their subsequent visits, and love both locations….Which cottage to choose? 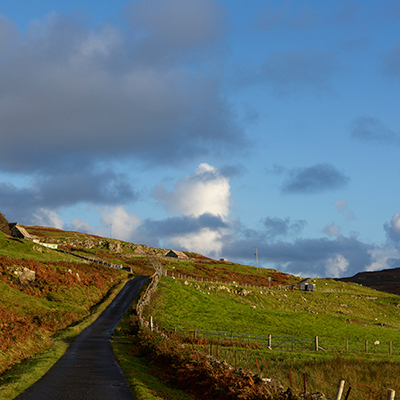 Please contact us if you have any questions about the specific location of these Mull holiday cottages. Your Sat Nav may try and take you via Tobermory. This will add 30 minutes to your journey.The quickest way to get here is: Turn right when reaching the main road once you get off either Fishnish or Craignure ferry signposted for Tobermory. 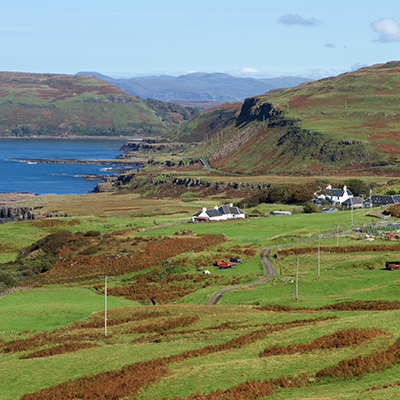 Drive north through the village of Salen. 2 miles north of Salen at Aros Bridge, turn left at the signpost for Dervaig and Calgary Art in Nature. 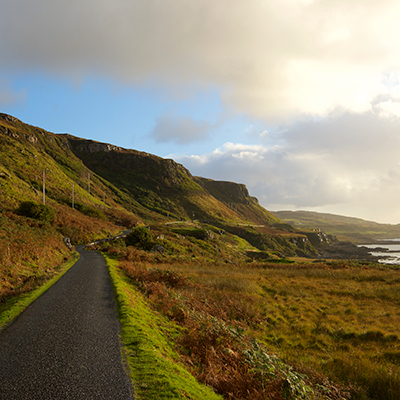 This takes you for about 10 miles along an unmarked road through Glen Aros and Glen Bellart to Dervaig and the sea loch, Loch Cuin. At the t junction, turn left towards Calgary. Calgary is a small collection of scattered houses and cottages with a seasonal tearoom (serving teas, coffees and light lunches), Calgary Art In Nature (sculpture trail and gallery), and The Beach of course! Drive past the beach. The headland you can see out on the left (south) side of the Bay is Treshnish Point. This is where you are heading. 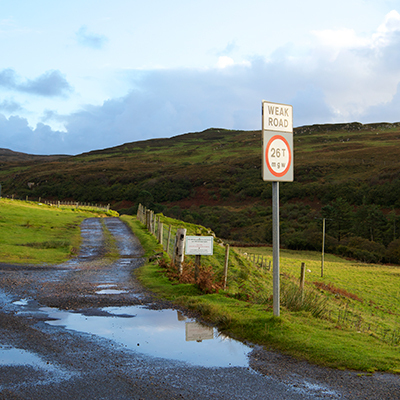 After approximately 2.5 miles you will see a ‘Weak Road’ sign with a track off to the right signposted Treshnish Farm and Treshnish and Haunn Cottages. This is where you turn. 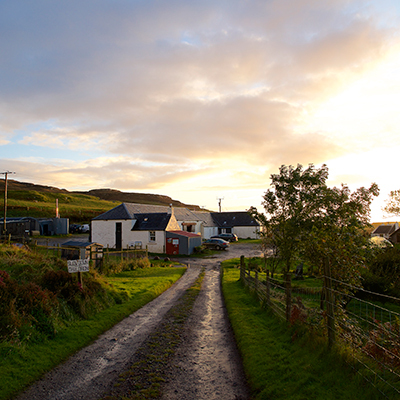 The farm track brings you off the main road, past our neighbours fields, and over the Ensay Burn – you are now on Treshnish Farm! 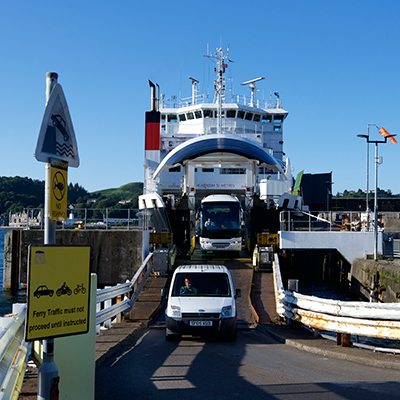 There are 3 ferry routes over to Mull, all operated by Caledonian MacBrayne. The Oban to Craignure ferry 40 minutes and should be booked in advance. Lochaline to Fishnish takes 20 minutes, first come first served, no need to book. Kilchoan to Tobermory takes 35 minutes, first come first served, no need to book. For further information and bookings click here. 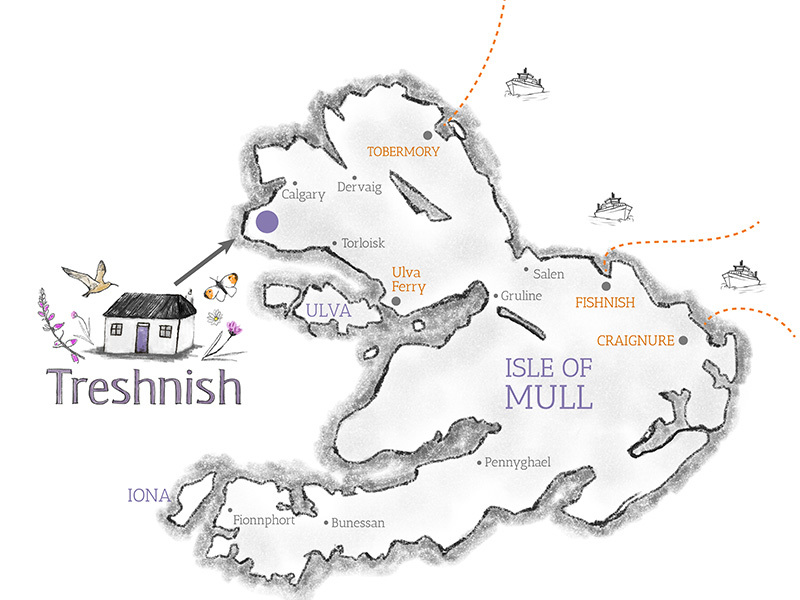 We now have an electric car charging point at Treshnish. It is one of a growing network of charging points around the island, making it far more practical and possible to bring your electric car on holiday. Trains run from Glasgow Queen Street to Oban (3 hours), and buses from Buchanan Street Bus Station (Glasgow). For Timetables for train and bus provided by Argyll and Bute Council click here. Alternatively there is a sleeper train from London to Glasgow or Fort William. There are places to hire a car in Fort William. Allow 3 hours from Glasgow to Oban, 3 and half from Edinburgh by car. For Lochaline, we always allow an extra hour and half on the Oban journey times. You have to catch the small continuous ferry service across Loch Linnhe and this can delay you if you just miss one and have to wait for the next. It is a lovely way to arrive in the Highlands, as the scenery is outstanding. You can always stop for a breathe of fresh air at the eco-friendly Glen Coe Visitor Centre near Ballachulish. It is cleverly sited in a glade of trees, designed by Gaia Architects and heated with wood-chip – just as the Treshnish Cottages are. We are often asked whether it is possible to holiday at Treshnish without a car. Our response is that Yes it is but that it also depends what you want to do during your holiday. It is certainly possible (and easy) to get to Mull by public transport without a car. There is a community run bus service on Fridays and Saturdays from Salen to Calgary. This meets the bus from Craignure. For more information please look at the Ulva Ferry Community Bus website. The twice daily bus from Tobermory to Calgary is also useful, it is a lovely 3 mile walk or cycle ride along the single track road to Calgary from here. We have had lots of people staying without a car. One guest spent a month here one winter without a car, and loved the walks to and from the bus stop, sometimes using a bicycle if there was shopping to carry. Just as we have had lots of guests at other times who arrive by car at the beginning of the week but don’t use it again until they leave at the end – as they are happy to walk everywhere. It all depends on your individual attitude and what you want to do with your time! We have a couple of spare bikes and we are happy to lend these to anyone without a car. Lots of our guests cycle on the island but some comment that the island is certainly not flat! Please do talk to us if you have more questions about car-less holidays here. Buses run from Craignure to Tobermory where there is a twice daily (not Sundays) bus which stops at Calgary – three miles from Treshnish. 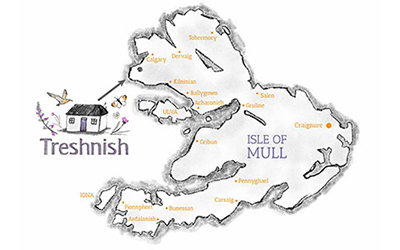 For all bus services on Mull click here. 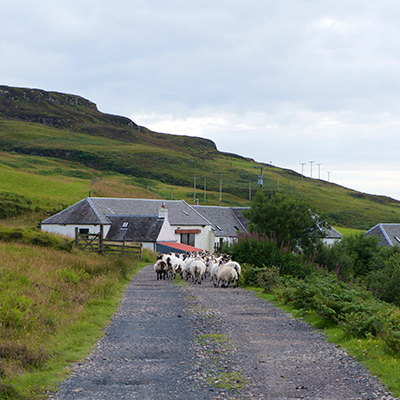 Our cottages are situated on a working farm, and access is along our uneven, rough farm track. We try to keep the track in a suitable condition for ordinary cars – which we and the majority of our guests drive. It can be bumpy, with potholes in places, so it is better to take it slowly. The track is maintained less often out of season, because of the likelihood of increased weathering. Driving too fast damages the surface of the track, so we respectively ask that everyone slows down and drives not faster than 10mph. If you have a car with low ground clearance and are concerned the track may not be suitable, please get in touch and we will gladly try to advise you. The nearest airport is Glasgow. A taxi service from and to the ferry is available but needs to be pre-booked, please contact us for details of taxi operators on the island. You can hire a car from Harbour Garage in Tobermory – a 50 minute drive to/from Treshnish. Book one before you travel though! You can get a bus from the ferry to Tobermory. Phone 01688 302103. You are very welcome to borrow the bikes that we have here for guests use, or you can go to On Yer Bike in Salen and hire from the professionals! Phone 01680 300501.